When I first started teaching all those years ago, I was not so keen on the teaching of pronunciation or phonics. It was after I returned to the UK, that I decided to learn more about the teaching of pronunciation. I also attended a training session by Adrian Underhill on the use of the Phonemic Chart and discovered that the area of phonics and pronunciation is not so difficult after all. Fast forward a few years later, having read up on many pronunciation books, I found the use of vowel sounds and their spelling still quite unpredictable. It was quite a relief to receive a book, written by Bob Knowles, dedicated to the sounds of vowels. This book is called, as one would expect, “When Vowels Get Together” and focuses on “the different ways that vowels pairs can be pronounced” (Knowles, p.1). I was unaware how unpredictable and ambiguous the English language can be, especially when it comes down to vowel pairs. In fact, the other day I came across a video on YouTube which demonstrated this perfectly. For the First Chapter, Bob Knowles introduces the paperback version of “When Vowels Get Together” very well and introduces the reader to the considerations included within this publication. These include why the book was written, why readers should use the book, how readers could use the book as well as the differences between a paperback and electronic version – it is invaluable that this book is available in different formats. Throughout the book, the author introduces the vowel sounds in a logical fashion, with readers being guided through vowel sounds beginning from ‘A’ all the way to ‘U’. With each vowel sound, there is an associated vowel pair in alphabetical order. For example, with the vowel sounds beginning with ‘A’, Knowles has incorporated spelling with all different variations of vowel pairs such as ‘aa’, ‘ae’, ‘ai’, ‘ao’ and ‘au’. With each dedicated chapter or sub-chapter, Knowles has created a wonderful table for the pronunciation variables with each vowel pair and their corresponding percentile for the respective pronunciation variables. 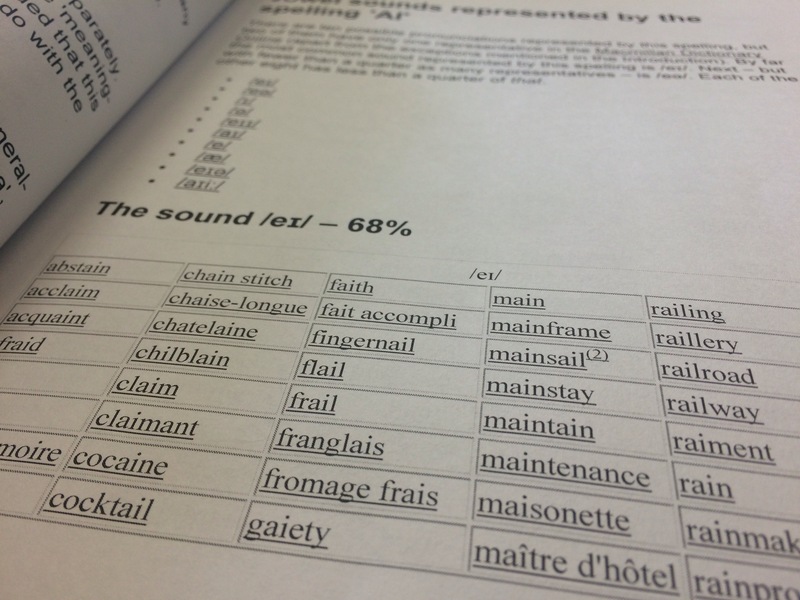 Therefore, you may refer to page 20 and note that the vowel sound represented by the spelling of ‘ai’ will have a 68% chance of being pronounced with the sound of /eɪ/. There is a table also included with a variety of different spellings. Each chapter focuses on the sounds from various different vowel pairs and Bob Knowles provides the information in an easy and logical format. You soon realise that almost all words are underlined in the tables throughout the chapters. Initially, I was unsure why these words were underlined but then you discover that in the eBook versions, there are links to the Macmillan Dictionary Online where a reader could tap on a word, they are then transported to the definition to the word as well as the pronunciation of the word. You also notice that this book has real potential as an eBook but unfortunately that is lost with the paperback version. “When Vowels Get Together” is a fantastic book which helps the reader learn more about the relationship between varying vowel sounds and their respective vowel pairs. It can be usefully exploited by teachers for classroom use, and if teachers are keen to develop learner awareness of vowel sounds and spelling then this book is absolutely brilliant. I would recommend any teacher to have the chance to refer to this publication so that they learn more about the reason how particular words could be pronounced and for learners to make an educated choice when faced with a new word. I received a small package from Cambridge University Press last week and was eager to open it up and see what I had received. Sure enough, as I was expecting, my new copy of “Penny Ur’s 100 Teaching Tips” had swiftly been delivered. My first reaction was, “wow such a small book” and then I started to look at it in more detail. I instantly realised that this book is not meant to focus extensively on English language teaching, but is solely a practical source of information for teachers in various areas of teaching. We already, for example, have books which focus on Classroom Management Techniques or lesson planning, and it is refreshing to read a book which cuts down on the waffle and offers readers practical and clear ideas to incorporate in class. Penny Ur has authored or co-authored many practical books before such as “Vocabulary Activities”, “Five Minute Activities”, “Teaching Listening Comprehension” as well as “Discussions that Work”. Incidentally, my favourite book in my early years of teaching was “Five Minute Activities” and there were so many practical ideas which I incorporated into my teaching. Nonetheless, let’s have a look at her latest publication. Further down the page there is additional teaching tips and techniques which the reader could easily incorporate into their own classes, such as using a picture-book with young learners to tell a story, using online video versions to support your story, as well as using jokes or other strange events to support the telling of stories and also keep students’ attention. This is one example from the many practical ideas within “Penny Ur’s 100 Teaching Tips”. All tips are broken down into an easy-to-read format and inspires the reader an opportunity to incorporate these invaluable ideas. The major advantage to this book is that it is also downloadable as well as being available in paperback. The digital formats available include Apple iBook, Google ebook, Kindle ebook and an eBooks.com ebook. So if you wish to purchase this but are unable to purchase a paperback copy, you can purchase it in a digital format. It is not going to be a thorough book on all aspects of English language teaching as this is not what it is focused on. It is a book on the areas of teaching which are more pertinent to teachers and offers a number of ideas which readers could use or tweak if they should wish. As Penny Ur mentioned in her introduction, readers should not “regard [the teaching tips] as directives from an authority, but as suggestions from a colleague” (p.viii). The reader is encouraged to use the tips and techniques selectively. Actually, this book reminds me of the teaching tips nearer the back of Jim Scrivener’s “Learning Teaching” where there were a number of recommendations for teachers to consider on all aspects of language teaching. I was so inspired by some of these statements by Scrivener that I typed them up on a computer, printed them out, cut these up and laminated them. These self-made flashcards are with me to remind about teaching which can so easily be forgotten. But I am also pleased to say that the book will also be with me so that I am able to get ideas for teaching. I recommend “Penny Ur’s 100 Teaching Tips” for any English teacher as this book is a wonderful reference book for those seeking a quick technique with regards to an area of teaching. I can see teachers referring to this book if there class observation highlights a few areas to focus on for next time. Last week, I was contacted by Amanda Momeni about receiving a book about the Certificate in English Language Teaching to Adults (CELTA) course. For those that are unaware, the CELTA is a recognisable four week full-time (as well as nine week part-time) course for those that wish to pursue a career in English language teaching, either in their home country or abroad. It is recognised as an intensive course and puts all trainees through their paces. When I took the CELTA course nearly ten years ago, the Director of the British Council in Seoul mentioned it was the equivalent of a boot camp for English language teachers and I agree to a point. It is incredibly tough. In the first chapter, ‘Meet the Trainees’, the reader is introduced to four fictitious characters named Harassed Henry (a gentleman who has been made redundant and has decided to undertake the course), Fastidious Felicity (a lady who has followed her husband on his career and is now deciding to do the CELTA), Chilled-out Charlie (a chap who happened by chance to do the CELTA course after a gap year before university) and Anxious Annie (a lady who has just graduated from university and is seeking employment yet appears worried about the exposure that she will face during the CELTA). All names include an imaginative adjective preceding their name and you can start to imagine the different type of people that CELTA trainers may encounter during the course. Chapters two, ‘Course Content’, is quite short having a fictitious conversation between Harassed Henry and his wife, Pleasant Pat about the content of the CELTA, the criteria for passing as well as what the course includes. The fourth chapter, ‘Getting Accepted’, guides the reader through basic questions for potential CELTA candidates to consider, such as “Am I fully committed, and able to dedicate 100% of my time to a full-time course?” or “Have I got the PC skills to manage basic programmes, such as Word?”. It offers possible trainees the chance to reflect on whether the CELTA is suitable for them. Other parts of this chapter include the application procedure, the language awareness test and the interview. It offers invaluable advice for those that are considering the CELTA and areas to consider during the application process. The fourth chapter, named ‘Preparing for the Course’, suggests ideas for the possible trainee to consider prior to commencing the CELTA course. There is a recommendation by the authors about what they suggest as a ‘sleep bank’ and filling up on your rest prior to the course. There is also a helpful checklist at the end of this short chapter for readers to consider. The following chapter focuses on Day 1 of the CELTA course and I can relate much of my own experience to this. All fictitious characters include a diary insert about their first day of the course and their own opinions. It is an interesting idea and allows readers to reflect on their own first day – had they also graduated from the CELTA. The following chapter, ‘Organising Your Time’, provides readers with some highlights of those well-known characters from the book – if you have completed the CELTA course, you will start to recognise particular traits with other trainees who were present during your course – as well as invaluable tips to consider when organising your personal time, such as ensuring that one is aware of deadlines for written assignments, not leaving anything to the last minute or keeping your CELTA portfolio up-to-date. It is a useful chapter and one that readers of the CELTA course will quickly start to realise when managing their own time. Unfortunately, for me when I undertook the CELTA course in Seoul, I had an hour and a half commute to the Training Centre. This meant that I had to wake up at 5am, catch the first bus to the train station, catch a train to Seoul and then get a tube to the Centre. Then I had another commute back home where I prepared my lessons till the late hours of the evening. It was one thing that I would not recommend anyone to consider and if I were in a different position, I would recommend anyone to be closer to the Training Centre. I had very little time to waste and much of it was dedicated to the course, so much of what is mentioned in the book is very different to my own personal experiences but I can relate them to those that were on the course with me. There were individuals who were working incredibly hard during the course, and were juggling their own time throughout their four weeks. The weekend is also a time to unwind and relax, as well as catch up on that much needed ‘sleep bank’. The additional chapters throughout the book are wonderfully written, guiding the reader every step of the way with advice on the actual teaching practice, the input sessions, writing the lesson plans or the written assignments of the CELTA course with delightful illustrations supplementing each chapter. The chapter before last, ‘Trainee Diary Entries Day 21’, is a well written conclusion for those that have completed the CELTA. I can relate well to this chapter as I remember finishing the course with all my other trainees and being invited out for something to eat and drink with them. It was a wonderful chance to relax after such an intense and tough course. The final chapter, named ‘Five Years Later’, looks at predictably at all CELTA trainee characters from the book and where they are now. Each character has moved on from the initial course, each carving out fictitious careers paths in the whole world of English language teaching. I recommend readers to leave the final chapter until they have read the entire book as it would spoil the benefits that this chapter has to offer. In fact, I would recommend those that are doing a CELTA course to leave this chapter until they have written their five year plan. Ideally, readers should leave this chapter all together after five years and reflect back at their five year plan from the CELTA course. I remember from my course that I wrote that I wanted to focus on teaching Military English, become more involved in Examining and teach more adult language learners having taught primarily to young learners. How things have turned out. The book is aimed at potential trainees for the CELTA and offers some incredibly valuable tips to consider while undertaking the course. One aspect would make the chapters more accessible were if they had been numbered. Each chapter, although not a problem, seems to seemingly cross to the next chapter but perhaps it would make sense for readers to have some signposting when introduced to a new chapter. If you have completed the CELTA and would like to reminisce about it, I would recommend this book as it would offer the reader a chance to think back about what they had undertook and what was included. It was a very memorable event and reading back on all stages of the course, leaves me with fond memories. This book helped reflect on these. Finally, it is by no means a single book which helps the trainees throughout the course, they still need to do the hard work and there is all the other recommended reading for CELTA trainees to consider purchasing as well. This is a supplementary book which is solely focused on the CELTA course and I wish it had been around when I took the CELTA all those years ago. I’d recommend the book for those that are considering doing the course and would like to discover what is involved in the CELTA. It is also a light-hearted look at the course and supports graduates from the CELTA to reminisce. The book review was originally published in EFL Magazine on 12 June 2015. Last year, I wrote a book review for Philip Kerr’s book on “Translation and Own-language Activities” for IATEFL Voices. Today, I was participating in an ELT Chat discussion about own-language use in the classroom and I was looking for this book review for a while. I suddenly realised that I hadn’t included it on my blog. Apologies for the delay but please find the book review for “Translation and Own-language Activities” below.